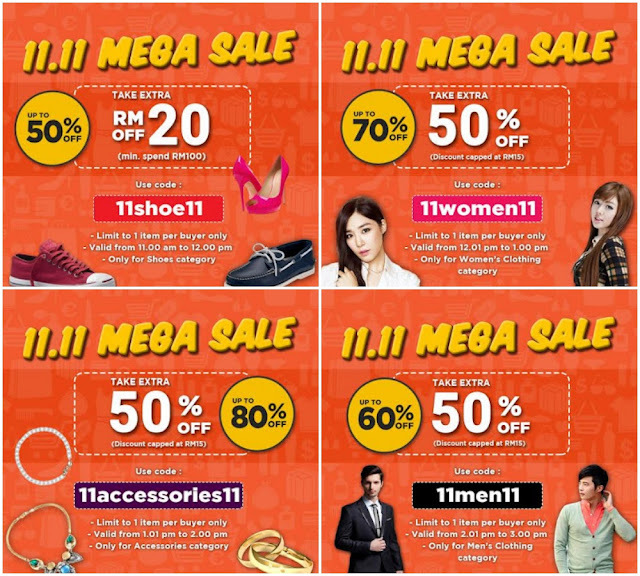 Attention to all shopaholics of Malaysia, if you havent heard, the news is out! Today would be a good day cause 11.11 happens to be one of the largest online sale day of the year. So better keep a lookout on your favourite sites to get yourself major discounts. 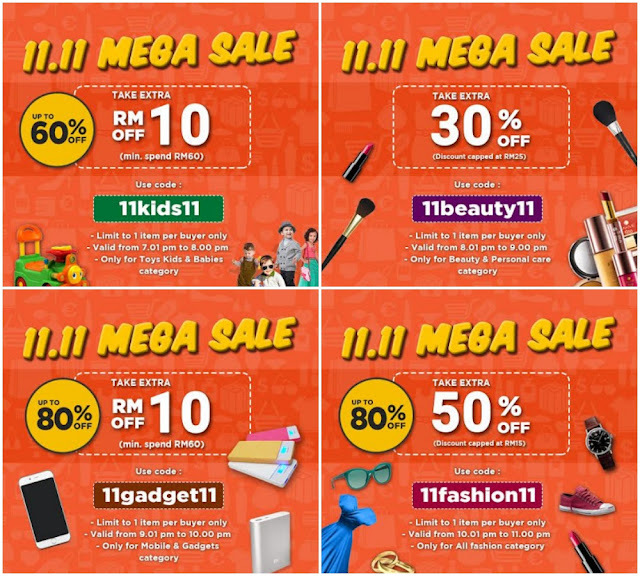 And if your dont know where to start, lets start with Shopee's Mega 11.11 Sale which is happening today, right now! 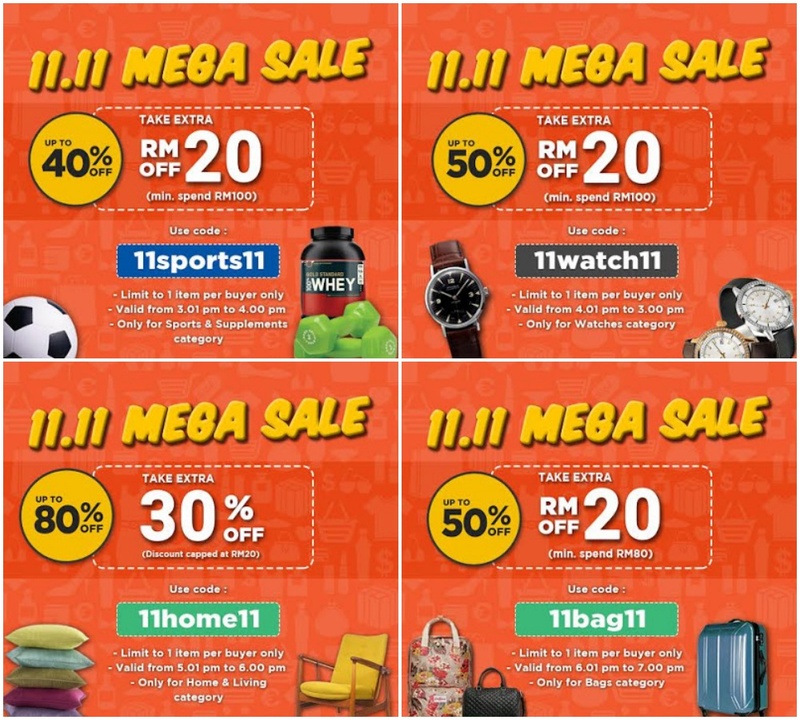 Do tell your friends and family, especially if theyre shoppaholics to be sure to check out the latest deals that they wouldnt want to miss. This is a ONE DAY ONLY SALE, where users will enjoy up to 80% OFF on their selected items. What you need to keep in mind would be that its happening from 11am - 11pm today with various categories will go on sale each hour to make sure the net doesnt brake. haha. So each hour will be catered to specific customers. Ready, Set, GO! Below would be some of the different codes during Checkout which you can apply to enjoy bigger discounts on your purchases. Also, if youre reading this through your phone, might as well get yourself the Shopee App for an easier browsing experience. Trust me, you wont regret it! So there you have it, set your alarms to be sure that you wont miss out on these exclusive sale happening ONLY TODAY! Download Shopee today and filling up your cart! Im already on stand by thinking on what to buy, what about you? ;) Do share with me what you managed to snag, or if youre waiting for the right time to set your purchases. Woohoo, im all in for beauty and fashion, and since im scrolling right now, i see tons of things that i've set my eyes on! YES! Wow! Big sales.. Nice one.. Let's start online shopping! i bought alottt of stuff today, omg!! those sales are irresistible! So many coupons. I just shopped online today as well, though from another site. I dare not explore these coupons anymore! did you managed to buy anything from those amazing deals? I've missed this sales :( Didn't manage to buy awesome deals. What about you? I miss the sales too. Hope manage to join you next round. Thanks for sharing.